There are these previous 2 posts that I posted about cheese tart. This time I got to try yet another cheese tart. I assure you, it's not going to be a disappointed one (if you are a cheese lover). I'm sure most of you now know about Hokkaido Baked Cheese Tart, seeing how they expand their franchise one after another. 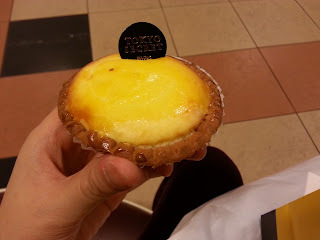 The one I'm going to write on is not about Hokkaido Cheese Tart, but Tokyo Secret - Hanjyuku Cheese Tart. This is a cheese tart of another level. The fragrance of this cheese tart is spread a few tenth metres away or a few stores away (let's keep it realistic) and the smell is irresistible. Anyone who is attracted by this smell will definitely have a peek on this shop, but may shy away by the price (I'm one of it). The size is of a huge one, the biggest tart compared to what I have tried previously. The colour of the tart is of golden brown. A delicious colour for a tart. Hello!!! Continuing from Part 1 and Part 2, this shall be the last part of my trip. We woke up early in the morning (early as in 8.30am). Supposedly, we planned to have scones in a famous cafe, but we were told that it only opens at 10.00am. 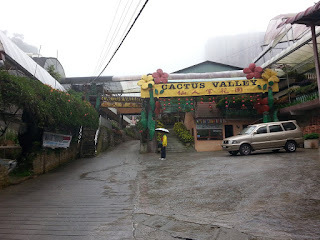 So, we delayed the planned and visited Cactus Valley, which is one the itineraries for today, but after a delicious nasi lemak. Only after this section of flowers did we see cactus. There's also this place with lots of beautiful koi fish. Continuing from part 1, there will be more adventures and flowers and plantations viewing as what's more can you do beside these? Well, I'm sure there are but there is not enough time for this short trip. 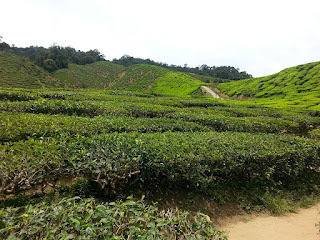 After the Lavender Garden, we went to yet another tea plantation. Apparently, it is the same one as we went earlier but in different location. The reason of stopping here?? Hmmmm... I wonder why? In this tea plantation, there are 2 special adventures here. One is the Safari and, the other, the ATV adventure. Since we have never tried it before and besides plantation viewing, we lacked of activities and so we decided to go for the ATV adventure!!! It costs RM 45 per person, but if 2 people drove a car, it costs RM 60. Apparently, it's a promotional price so I doubt it will remain the same after that. We had to wait about 20 minutes before our guide came back from its job. The whole track is about 2.5km and it takes about 30 minutes.